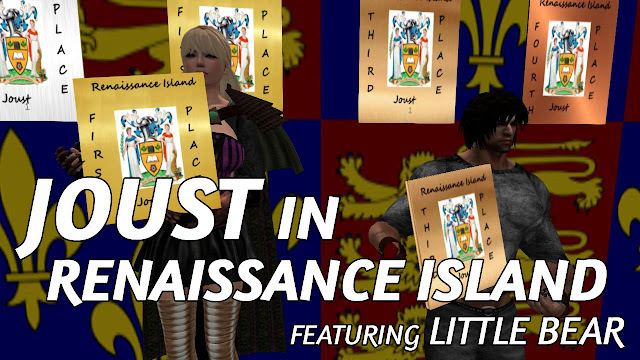 Joust in Renaissance Island In Second Life (10/4/2018) • Featuring Little Bear - KABALYERO - PLAY, BLOG & EARN! Joust in Renaissance Island In Second Life (10/4/2018) • Little Bear & Mr. Wooden Horse and, in this Second Life Jousting Tournament, the rules are a little bit different. For authenticity, the Jousting List is missing the outer rails or railings. Jousters are also only allowed to ride straight forward. No dodging, no avoiding and no swerving like the way jousting was done in the days of old. The Jousting Tournament here in Renaissance Island, for me, was very interesting because it's somewhat different from the ones I've seen or watched. Anyway, I'm looking forward to watching and sharing future Jousting Tournaments in Renaissance Island. Now, to see who participated and who won the Jousting Tournament in Renaissance Island, simply watch the entire video. P.S. LOL! I kinda ended the Livestream before the Awards were given because I thought there wouldn't be one but I stayed, waited and was able to take screenshots of the winners. Join Second Life & Eliminate Game Lag with WTFast! Download WTFast FREE or Get a WTFast Premium Account. Are you a Livestreamer? If you are then NOW you can livestream Second Life or any of your favorite games with Streamlabs OBS. It's like OBS but only better. Download for FREE.